With number one netminder Miika Wiikman missing through injury, a battling Genting Casino Coventry Blaze side were able to stick with the Cardiff Devils in their Challenge Cup encounter, the result though slipping away from them in the final period. Brit Jordan Hedley got the start, going on to claim the Man of the Match award after giving his team a chance to win the game throughout. It didn't start so well however with Mike Hedden scoring his first of two for the Devils on 7.39. Coventry didn't let that deter them though defending strong in front of their young goalie who later pulled off a miraculous save on the Canadian Hedden. Alex Nikiforuk tied the game early in the second period (20.29), beating Great Britain number one Ben Bows top corner on a breakaway. For the remainder of the period, the Blaze defence continued to stand strong, with plenty enough chances coming their way at the other end too. A second wasn't to be for the away side though and they became deflated after Joey Martin put the Devils ahead on 44.14, Matt Pope picking up a second assist of the night on the marker. 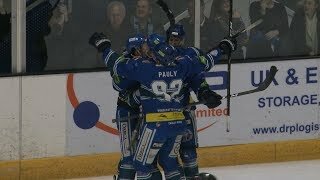 Jake Morissette (48.57) followed by Hedden's second (53.57) sealed the game for Cardiff with Layne Ulmer, a prolific scorer against Coventry in recent years ending the game 5-1 at 56.43. 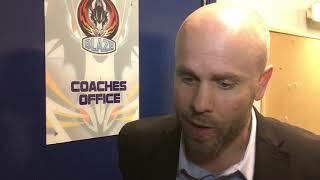 Blaze Head Coach Danny Stewart said, "I thought we competed hard and defended as well as we have for 50 minutes. The third got away from us a bit as guys started to push at 3-1 and the 5-1 score didn’t reflect our performance. In saying that, we need to find a way to start scoring goals. The chances have been there and so has the zone time. I thought Heds played well and was unfortunate we didn’t protect him as well for the last 7-8 minutes. We turn our attention to Milton Keynes now in the league, and need to get those 45-50 minute performances to as close to 60 as we can. Finding the back of the net on our chances has to get better if we want to start turning good performances into good results."